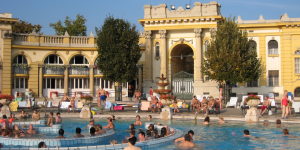 Home / Szechenyi Bath FAQ / Can you Leave the Bag in the Cabin in Szechenyi Baths? Can you Leave the Bag in the Cabin in Szechenyi Baths? Understandably, most visitors do not arrive at Szechenyi Bath with empty hands, so the question arises if you can leave your bag / suitcase or any luggage at the cabin or the locker? How safe are the storage facilities for valuables, like mobile phones, cameras, jewelleries, watches, etc.? This question is part of our Szechenyi Bath FAQ series. The answer is yes, the cabin can only be opened by your wrist band, which contains a specific chip. The code of the chip is randomly generated by a computer system, which means that each cabin (private changing room in Szechenyi Baths) has its own unique opening code. If you forget which is your dedicated cabin door, you can use the scanners attached to the walls within the thermal baths at various locations. The attendants at Szechenyi Spa Baths also can help you to locate these scanning machines. The scanners will read your wrist band in a short time (about 15 seconds). Hold your wrist band against the scanner and wait until you see your cabin number. The size of the cabin can easily hold a standard suitcase or a backpacker style bigger backpack. Please make sure to close the door properly with your chip equipped wristband, which opens and closes the door of the cabin with a randomly generated unique code. If you have valuables, you can buy the use of a smaller safe. You can also leave your bag in the locker. The size of the locker is 120x30x65 cm (1200 x 300 x 650 mm). The lockers are also opened and closed by your wrist band. There is no special code generated for lockers. So when you arrive at the thermal baths, and you get change in the wooden booth, you can choose any of the lockers whose doors are open. Once you packed in your bags, clothes, shoes, etc., you need to press your ‘wrist watch like’ wrist band to the door knob of the locker. If you have done it properly, you will see a little red flash. After the flash, you can check if you locked the locker door well (if in doubt ask any of the bath staff to help you). You can only open the very same locker door with your wrist band, so locker rooms are also safe to store your bag while you are bathing, using the saunas, or any of the 18 thermal pool and spa facilities. Logically, you do not have to bring your own lock for the lockers, they are not closed with old fashioned metal lockers but with the computerised chip lockers you get on your hand as a silicon wrist band. The bands are comfortable, waterproof, so do wear them during your bath visit in order to avoid losing your wrist band (which also results in an expensive penalty fee). Most locals bring a smaller (plastic) bag to keep some of their essentials with them, and place the bag not far from the pool, which they are in. Just keep the momentarily most important things with you for your bath, not your valuables. Instead of passports, we recommend just carrying a photocopy of your passport in Budapest. In you small bag, you can carry around your towel (rented towel or your own, or the hotel towel), very little money (e.g. HUF 500) for a drink or some snacks (but you can always go back for your wallet to the cabin or locker! ), and maybe a book or paper to read. A few of the visitors of Szechenyi Baths also don a water repellant storage in their necks (for mobile phones), which seems useful even if not so comfortable. 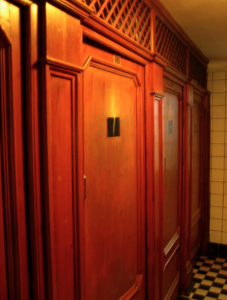 If you are suspicious and feel that the cabins or the lockers are not safe enough for what you possess, you can rent a special safety deposit box at Szechenyi Bath. Please let the cashier know in advance when you are buying your bath ticket that you are planning to place your valuables in a safe box (these are not huge boxes, but can easily hold a smaller camera, some jewels, passports, etc.). The safety deposit boxes are the only places that Szechenyi Bath management takes guarantee for. That being said, with over 1 million visitors per year there have been very very few incidents of theft reported in the spa baths, which means that the locker and cabin chip system is quite safe. I saw there were several pools outdoor, are they all closed or just one ? The outdoor swimming pool and outdoor thermal pool (togethet with the 15 indoor pools) are open. How much is the cost for special safety deposit box at Szechenyi Bath ? If I am booking online to skip the line, How can I add a special safety deposit box ? The safety box can only be rented on the spot (HUF 500). Thank you for your understanding. Can we pre-book tickets if we are coming at 6am? The online booking wants me to check something that says I will arrive between 9 am and 6 pm, but we want to arrive at 6 am. If we can, do I just check that box even though I will arrive earlier than 9am? if you wish to arrive before 9am, I ‘m afraid you can only buy the tickets on the spot. The online tickets are not valid before 9am. Thank you for your understanding. We will have our luggage with us. Is there a place to safely store it while we’re at the baths? Thank you! yes, you can store your luggage in the cabin (private changing room). Hi, I’ll go to Budapest in the middle of the next week and I would like to go to the szechenyi spa baths. I’m I’ll enter at 5 or 6 pm (probably) so what kind of ticket should I buy? The full-day ticket? entry with online purchased tickets are between 9am and 6pm. Hello, I am planning to pay for safety deposit box. My only worry is that you mention it fits small camera. My camera is 14x14x8cm. Will it fit to the deposit box? yes, it will fit in the safety box.